Girl with Cloudy Head: To read or to write, that's the question! 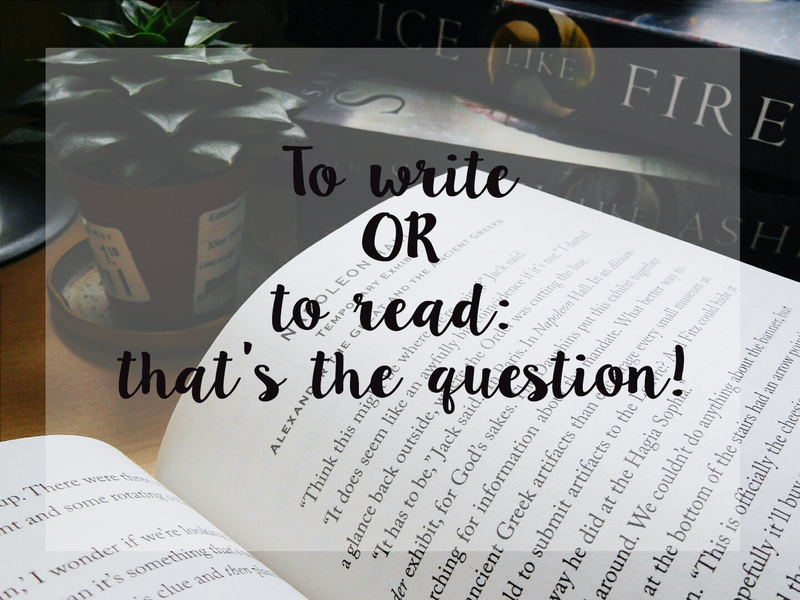 To read or to write, that's the question! I am indecisive person. And it's not like I cannot make an important decision. I can. But when there are two small things I love to do and I don't have that much time for both of them, that's when the problem begins. Reading vs. writing is the biggest problem for me. Sometimes I feel like writing. You know the moment when you desperately need to sit down and just open the folder with your story and pour all your emotions into the imaginary world you created? Yes, that feeling is amazing! Of course up until it's broken by you actually opening the document and staring at the blank page or rather at your last sentence, not knowing what to type next. Anybody feeling the same? Please, tell me I'm not the only one who's got troubles continuing with her story even though she knows how it should go. But the martyr I am, I stare at it for a few long minutes, sometimes it stretches to half an hour, when I close the document and the folder, frustrated because this is another day I didn't write anything. Oh, don't worry, sometimes it's better and I add one new sentence to the pile that tries to look like a decent story. And that's the moment when I say screw it and run to the nearest book because I'm in big need of therapy and what better way to brighten your mood with already existing world and great storyline? If there are more days like this one, it's easy for me to abandon the story I created and read books rather than write. I mean, I can either sweat blood and cry pieces of my soul because I cannot think of any good fight scene or I can safely lay in my bed with a book in my hands and the only bad thing that could happen is me not liking the book. And even that would be okay, because I'd be able to close it and pick another one. Yeah, balancing those two is hard for me and I can either write or read... and mostly I read. That's why I'm writing my story for two long years. 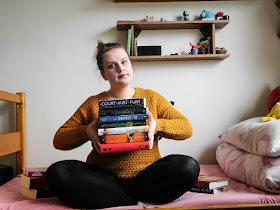 I love books too much and I have a lot of them in my TBR list and there's this neverending pressure that I won't read them all and so I try to go through them as quickly as possible because I want all of them to feel my love... but then I forget about my own story and my own lovely characters. It can be hard to stick to your story and not reading books for a while when they're calling out your name and pleading for you to pick them up. Especially, when you're not in the writing mood for like... ehm... three months. I set my goal to read at least 5 books a month which should leave me plenty of time to actually write my story and it works, unless there are amazing sequels coming out and you need them all right in that moment. Argh, the life of bookworm and writer is so difficult! Okay, your turn. What are your tips and tricks to stick with your writing as well as reading? What are your secrets? Please, tell me, I'm desperate. Are any of you suffering from indecisivenes when speaking of writing and reading? It's so hard *cries* And now I have to balance uni work as well!! There just aren't enough hours in the day, and you always have to sacrifice something (or that's how it feels). Mostly I try to read on the train and write when I'm at home, but I'm still working out the balance! BUT IT'S HARD. THE WRITER/BOOKWORM LIFE IS SO HARD. Oh, I'm definitely not a speed-writer or fast reader so I'm greately jealous of you! :D And I try no to think about editing because for me drafting is really hard, I don't want to imagine what editing will be like. Oooh this is my struggle! And then add in blogging, and there's a real problem haha. I WANT to do all the things, but then my body would eventually get angry and give out on me, I assume. So writing ALWAYS suffers. For me I think it is because it's the scariest. Reading is a fabulous escape, and blogging is fun, and interactive. But then the writing is looking at me and it's terrifying- I don't have a clue what I am doing! I have exactly zero tips, because I have not written a word since NaNo ended. That is not great. But I wish you TONS of luck. I know for me, once I start I can do it for awhile- so maybe you need something to motivate yourself to start? Like, you can have a reward! Bribe yourself if you must! This is actually something I am now considering... I can buy myself a book or something if I write 10K words or whatever!